According to a post at the Nikkei Business pages though the GTROC FB Page, Mr. Mizuno has officially retired from Nissan on March 31, 2013. This article was translated by Google translate, but you should be able to get the gist of it. The following is a translated email that was published on the Nikkei page. Thank you for your support in a warm place in a variety of more regular basis. We will be grateful indeed if there with the support of everyone who was also Yatteko ever been. We will send an e-mail will contact you want this to be of today, though there are indeed humbled by personal matter. Was to leave the Corporation Nissan Motor Co., Ltd. as of March 31 this time. "P10 Primera" into FF Sunny and Bluebird "by Nissan," and "Proposal of new packages R32 Skyline GT racing activities in 1995 and from 1989 Group C sports prototype", "the FM package from 2000 we have been engaged in a variety of races, such as planning and development and selling, etc. to 是 R35GT-R "of the proposed PM Package" has been working until now and "Z33, FX35 and V35 Skyline was proposed. 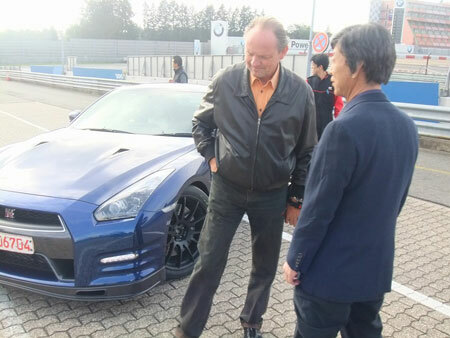 R35GT-R, who was in charge from 2004, among them was a project that puts a special meaning for me especially. Returning to the power and ability of Japanese culture ", the minds of the Japanese, and the dream (time, money, people, things) surprisingly fewer resources compared to traditional hospitality and if you have a car that was created through the essence not only to create products and efficient "cheap" proof of what is achieved in a short period of time more than the ranks of the top global brands in the super car category than ¥ 10 million that has been said, nationality valuable of Japan together In order to create the impression of customers, product stage is also called people and processes development itself, that team make the brand instead of selling only thing that car just "" urgent need in the important core of the global strategy, the Year for its There was also a project that I put the challenge to build a system model and "such a thought.